The first issue of the Pittsburgh Gazette was published on Saturday, August 12, 1786. 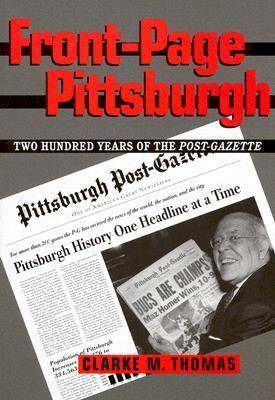 Nearly 220 years later, it lives on as the Pittsburgh Post-Gazette, the dominant paper in a major U.S. city: survivor of name changes, ownership sales, numerous mergers, and a competitive landscape once populated by more than fifty newspapers. Clarke Thomas's history of the paper stretches from the Whiskey Rebellion to the controversies surrounding the North Shore and downtown redevelopments of today. By focusing on what stories were reported-and how-he adds a fascinating dimension to the history of Pittsburgh and its people. The story of the Post-Gazette is inextricably entwined with that of its city. Thomas reveals how the paper and its predecessors have influenced local politics and business, through behind-the-scenes personal connections as well as the editorial positions advocated by the publishers. By looking closely at key business decisions, Thomas illustrates how the first newspaper published west of the Alleghenies emerged as the last one standing in Pittsburgh following the devastating labor strike of 1992. Over the years, almost every reader of the Post-Gazette has found something to complain about. To Republicans, the paper often seemed uncritically supportive of officials elected by an overwhelmingly Democratic electorate. To Democrats, the frequent revelations of misbehavior by various public officials amounted to party harassment. Neither group was happy with the Post-Gazette's reputation as a ""switch-hitter"" in endorsing candidates of both parties. The paper's editorial positions frequently have come under fire. Many readers did not agree with the newspaper's support of the civil rights movement and school desegregation in the 1960s. Roman Catholics have been troubled by the Post-Gazette's pro-choice stance on abortion. Jewish readers have been upset with the emphasis on the rights of Palestinians in the discussion of Arab-Israeli relations. Business leaders have decried the shift away from the stridently pro-business principles the Post-Gazette espoused in the mid-twentieth century. Progressive political groups complain that it hasn't shifted far enough to reflect the current needs of the city. In the end, however, many Pittsburghers have come to trust and respect the paper's fairness in dealing with various viewpoints. And, as Thomas argues, this explains why-from the Johnstown Flood to the crash of US Air flight 427-whenever Pittsburghers have needed or wanted the news, they have turned to the Post-Gazette.